Tour of Montescaglioso and Miglionico, two towns in province of Matera with important medieval buildings. Montescaglioso, with its imposing Benedictine Abbey, didn’t acquire much importance until when the Norman rule, a time when monastic communities were granted land and privileges. It was under this time that the monumental Abbey was built. 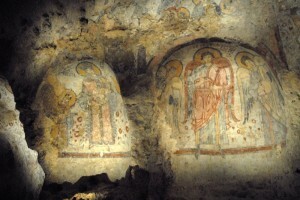 Transfer to the Crypt of Original Sin, a 9th century church called the “Sistina Chapel” of Rock Churches. Final walk in Miglionico, a small village with a medieval castle called “Castello del Malconsiglio”, setting for the “Barons’ Conspiracy” to murder the King of Naples, Ferdinand I of Aragon in 1485, a conspiracy which ended with the slaughter of the barons. Not to be missed an almond pastry by a local patisserie.